Each year, Pod Volunteer has the amazing task of using funds from the Pod Charity to provide grants to a selection of our incredible projects. This year, we were thrilled to donate to our Elephant Care and Research project in South Africa – a unique project which seeks to research both elephants being cared for by humans and elephants in the wild. This research is used to better understand the amazing African elephant, provide solutions to human-elephant conflict and ensure best practice for the welfare and husbandry of African elephants. Alongside years of field observations, the local team in South Africa also have another source of research: elephant dung! They have found that reproductive cycles are strongly linked to behavioural changes they have observed in the elephants; understanding these cycles and being able to better monitor and predict them allows the team to improve their management of the herd! First, after collecting the fresh sample, it is labelled, frozen and stored in what they charmingly refer to as their Dung Library! Next, the team carry out hormone extraction on the sample. They are focusing on progesterone, a female oestrus cycle hormone, as well as Cortisol, a stress-related hormone and comparing these with observations carried out by volunteers in the field. 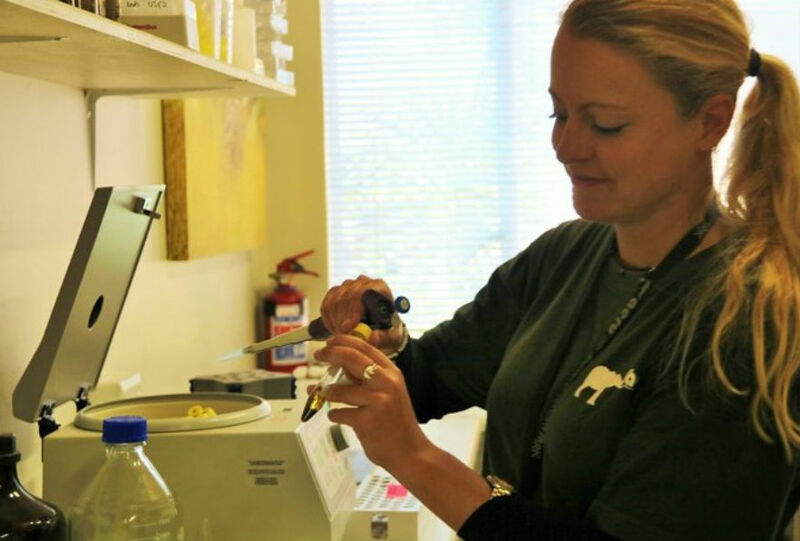 The last stage is a hormone level assessment – currently, the team do not have the facilities to do this on site and the samples must be sent to Pretoria, all the way on the other side of the country! This is where Pod’s charity grant comes into play – through our donation, we are contributing to the upgrade of the current lab so that the team can do this on-site. In the future, they also hope to get enough funding to acquire the necessary equipment to do the hormone level assessment themselves. By achieving this goal they’ll be able to progress with their important projects a lot faster in the future. Currently, the team have 2474 processed samples - a major task they simply would not have been able to accomplish if it hadn’t been for the help of their incredible volunteers! If you would like to find out more about this amazing project and how you can join the team in providing care and contributing to research on this incredible herd of African elephants, click here.